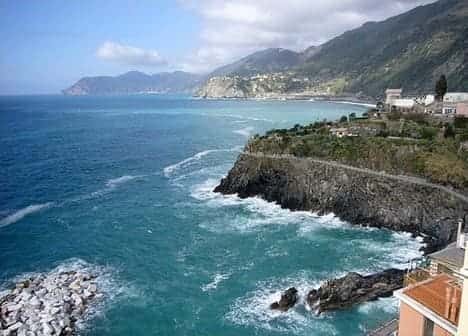 Riomaggiore is a partially mountainous coastal municipality of 1.542 inhabitants, located at 35 meters above sea level Province of La Spezia, Its territory covers an area of ​​10,30 sq. km. The first village on the sea west of Portovenere is Riomaggiore, the first of the Cinque Terre. The name comes from "rivus Maior" now covered by the steep main street, flanked by two rows of houses that go down to the sea. Built in the fourteenth century, in 1343 it separated from the territory of Biassa community. The Mediterranean vegetation dominates the landscape, from rugged cliffs to the trails that climb up to the ridge of Mount Parodi, beyond which appears the gulf of La Spezia: one of these rooms paths rapidly from country to 400 meters of the shrine of the Madonna of Montenero, the first we find the "way of the sanctuaries" that passes upstream of the Cinque Terre. The church of San Giovanni Battista is the 1341. The thirteenth-century castle remains only part of the walls and the remains of the two towers, visible on Cerricò hill, in a panoramic position. On the promontory of Torre Guardiola, where once there was a strong, it has now been set up a nature trail for bird watching; also it includes an original creative writing workshop outdoors. The town is also part of Manarola, similar in everything to Riomaggiore, which is connected to the famous Via dell'Amore carved into the cliff and a short train tunnel. The village, however, is the oldest: the first reports date back to the early thirteenth century. The parish church of San Lorenzo, with Gothic façade and rose window, is the 1338. Volastra, on the trail to Corniglia, is a village of Roman origin that preserves the original structure. Riomaggiore is included in the National Park of Cinque Terre, which is also a marine reserve: the many rare species of plants and animals are protected, and the fishing is regulated. All kinds of water sports can be practiced, from diving (there is a diving center) to the sail. The DOC wine of the Cinque Terre is a white famous all over the world, like the Sciacchetrà, produced with the raisins, very difficult to find. In Riomaggiore he was born the painter Telemaco Signorini. Do you want to contribute to the completion of this page dedicated to the country of Riomaggiore?